Today’s guest post was submitted by Trish Bredar, 2nd year English PhD student and graduate assistant in the Grad Careers Office. The views presented are her own, but we highly support them! Acclimating to a new semester after winter break can be a bit of a challenge. It ushers in a new schedule, fresh deadlines, and a slew of emails and meetings. Not to mention having to brave that arctic air as you walk across campus when, let’s face it, you’d rather be working from home in your sweatpants. Fortunately, though, this semester’s transition was brightened by the opening of the brand new Duncan Student Center! That means an improved exercise facility, more dining options and study spaces, a graduate student lounge (with free coffee!) and a brand new Graduate Career Services office space. As you may know, Graduate Career Services has officially relocated from our previous location in the Main Building to a new space on the fifth floor of Duncan. 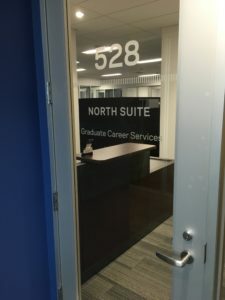 The fifth floor serves as a dedicated Center for Career Development which also houses the Undergraduate Career Services team and Mendoza Graduate Business Career Services. Not only does the space itself offer upgraded facilities for students, staff, and employers, but it also opens the door for increased collaboration between Career Services professionals—which means even more innovation and insights that your graduate career consultants bring to the table. Even if you’re not coming in for an appointment right this minute, there are some great spaces on the fifth floor that you should know about. 40+ interview rooms with various seating configurations and technology setups ensure that you can find the perfect space for group, in-person, telephone, or Skype interviews—just scope out the ideal room and book it at a fifth floor welcome desk. This floor also houses Duncan’s hidden gem of work spaces, with plenty of window-facing open seating and tables which students can use even after business hours. I’ve already scoped out a comfy couch with a perfect view of the Dome and the Basilica where I will be spending a lot of time this semester. While the beginning of a new semester can be hectic, it’s also a great time to set professional development goals for the months ahead and check in with your career strategy. Think of the new Grad Careers offices as an extra incentive to reassess your plan and perhaps seek out some expert advice in a fresh new space!